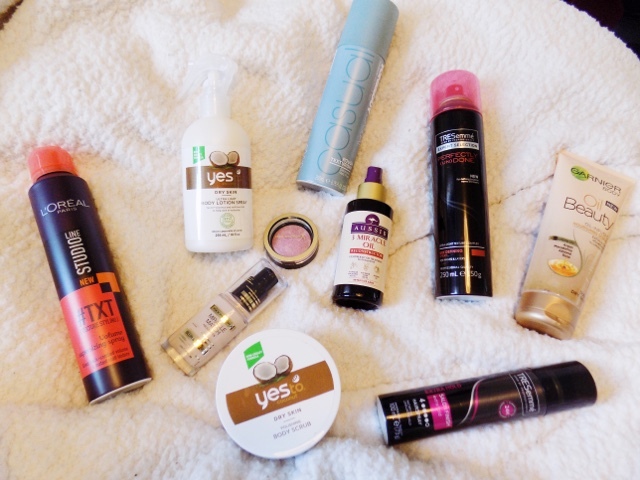 It seems every pay day I go into the drugstores and pick up some new goodies to try, review, love, or regret. So here's this months haul. It's very hair heavy as I have cut my hair super short and so I'm experimenting with different products and different styles and I'm sure I'll do a post on my favourites once I've tried them all out. 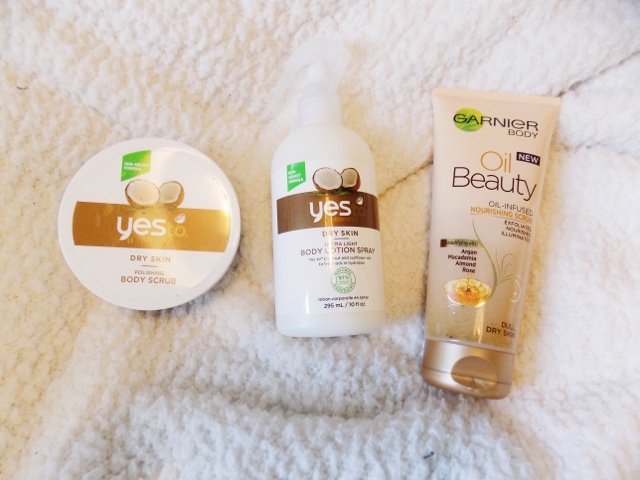 I am a massive fan of coconuts, and I don't know why but I've never tried the Yes to: Coconuts range, so when I saw the Dry Skin Body Scrub and the Dry Skin Ultra Light Body Lotion Spray, I just had to pick them up. The scrub is very gritty but not too harsh and it sticks to your skin, very similar to the Soap & Glory Flake Away and I can still smell it in the bathroom for hours after I've taken a shower. I love anything coconut and this even smells so much better than the The Body Shop Coconut Range. This range is 97% natural and has coconut and sunflower oil to help lock in hydration. I love the spray lotion, it makes things so much easier and quicker and although it's a light lotion, it's still pretty hydrating so for Autumn, I think it's going to be perfect. Plus, the scent lingers so if I go have a shower and then go to bed, my boyfriend always says I smell really good, and his sense of smell is pretty limited. I'm pretty sure he uses it when I'm not there, but shhh. I also repurchased the Garnier Oil Beauty Nourishing Scrub which is my favourite scrub to use mainly for when I'm shaving my legs as it makes my skin so soft and smooth and it's the perfect amount of grit. Plus it has Argan, Macadamia,almond and Rose oils in so the nourishing part of the name is definitely true. I wonder if the coconut scrub will take this ones place? lightweight oil treatment for damaged hair, it has some fantastic ingredients including Australian Macadamia Nut Oil, Australian Jojoba Oil and Avocado Oil which makes your hair silky smooth, fabulously shiny and it says no matter how much you use it won't look greasy and like you've bathed in the stuff. This smells delish and you can use it 3 ways, before shampooing, on damp hair to repair the smoothness, and on dry hair for a fabulous shine which doesn't weigh your hair down or anything, its super lightweight so no risk of limp and flat to your head hair. It's fine for travelling as it's a plastic bottle and I just love it so far. I picked up the L'Oreal #TXT Volumising Supersizing Spray which I've had before and remember really liking it so thought I would try this again and see how it works with my new 'do. 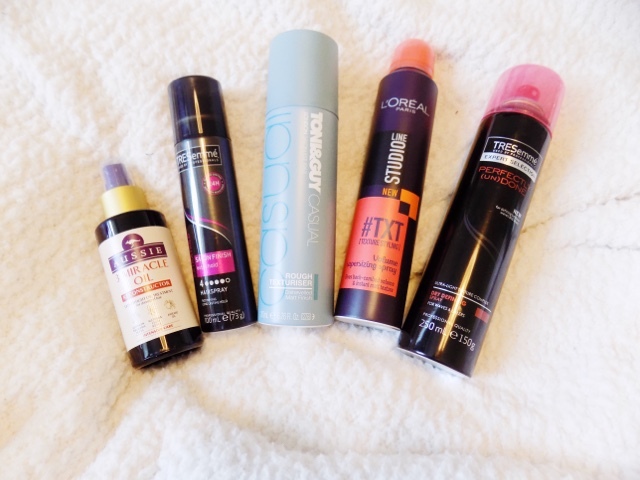 For the purposes of the post I will be doing on these products I purchased the Toni & Guy Rough Texturiser which I have also used and thought it was incredible. It leaves a matte finish, smells good and it really does work. I haven't tried anything from the Tresemme Perfectly Undone range so I thought I would try out the Dry Defining Spray which says it's a super lightweight spray that will get the best of your waves and will give a great effortless effect to layers in your hair. I think this will be great to get that, I got out of bed and this is how my hair looked, kinda look which I am all for. The least amount of time I can spend doing my hair the better. I picked up a mini Tresemme Salon Finish Extra Hold Hairspray so that I can keep it in my travel bag for when I stay at my boyfriends house. Nothing fancy just a standard hairspray. Maxfactor have recently brought out a new foundation, the Miracle Match Foundation and as always I'm in the shade Light Ivory. This is supposed to enhance the look of your skin, give a Dewey, healthy looking complexion, hydrate your skin and blur imperfections. It's on the higher end of the drugstore foundation scale at £12.99, although I purchased it whilst on offer. There are 12 shades for this foundation, and I love the black and gold packaging, although the glass bottle isn't idea. For traveling. I, really looking forward to trying this out, although I find this shade looks quite grey in tone in the bottle so hopefully it looks more natural and skin like when applied. I also repurchased the Maxfactor Creme Puff Blush in Seductive Pink as I smashed mine all over my bedroom floor last week, which made me incredibly sad and I almost cried, as this is my favourite blush ever, ever ever ever. 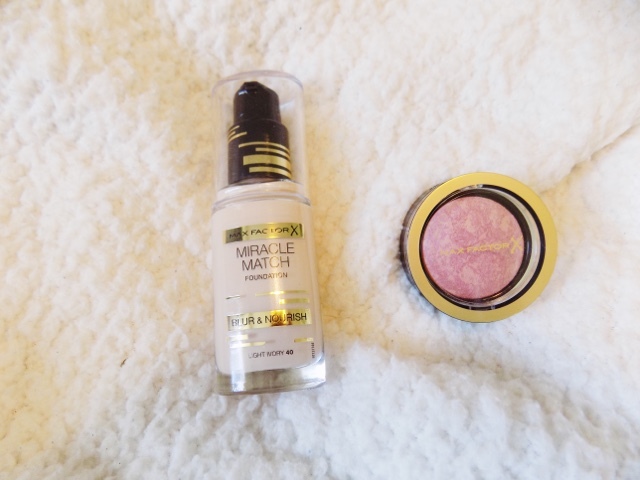 As you know I love trying new products especially when they're affordable, so if you know of any new launches in the drugstore then let me know in the comments.